BendPak's HD-Series alignment lifts are engineered to meet the strenuous demands of even your toughest professional lifting jobs. Designed into every HD-Series lift is a laundry list of key features as long as your arm to ensure that BendPak is the absolute best you can buy. Our competitors might say we overdo it, but we don't include components for the sake of frills and flash. We design our lifts with the attributes we feel should come standard with every lift—the kind of lift we would want to (and do) own. Take the HD-35XA for instance. This is the sturdy beast you want as the backbone of your shop; especially if you want to specialize in servicing heavy trucks. Our alignment system features front turn plates and rear slip plates built right into the runways. The wheels always respond to your adjustments with no resistance or hassle. We call it "free floating." You'll call unbelievably easy. It's just another way that you can bet on BendPak lifts for increased durability, safety and productivity. Spend less time worrying about what you're working under and more time doing what you love. Our commercial-grade lifts are second to none and recognized the world-over as benchmarks of dependability and quality. Heck, it's how we got our slogan. Love the aligning convenience offered by the HD-35XA, but need different lifting power or runways? Consider the 18,000-lb. capacity HD-18A, the 27,000-lb. capacity HD-27A, the extended 27,000-lb. capacity HD-2X7A or the 35,000-lb. capacity HD-35A. The HD-35XA is equipped with multiple adjustable height locking positions for variable-height parking. A convenient push-button pneumatic safety lock control releases all four independent safety locks simultaneously. Each lift is supplied with 4 high-quality stainless steel lifting cables, rated at 40,000 lbs. each. The combined rating of these cables is over 888% of the maximum lifting capacity of the entire lift! And we make sure it looks tidy too—all lifting cables are fully enclosed within the lift structure itself. 12" x 12" base plates provide a solid foundation for the HD-35XA. Each lift is equipped with a single hydraulic cylinder, hidden away under the runway for minimum exposure and maximum reliable performance. Our industrial-grade hydraulic cylinders feature a single-piece, pilot fitted, machined steel piston, wrapped with specially designed, pressure loaded U-cup piston seals, backups and wear bands to virtually eliminate fluid bypass. The micro-smooth chrome-rod is machined from high-yield, ground and polished C-1045/50 micro-alloy steel and plated to a minimum of .001" diametrically, to ensure superior cylinder operation and life. The superior-design high durometer, mechanically-loaded rod seals make rod leakage is a thing of the past while a specially formulated abrasion-resistant urethane rod wiper provides exclusion protection. The welded cylinder body is made from robust steel tubing produced to exceed ASTM specifications. This combination of superb base material and superior processing ensures that the cylinders remain straight, smooth and last a very long time. An integrated flow restrictor provides a controlled descent in the case of an unexpected hose rupture. All HD-Series lifts feature a durable powder-coat finish that gives the metal a high-quality, extremely durable finish which can withstand even the harshest environmental or chemical conditions. Unlike other companies that claim to powder coat, we take pride in our meticulous 10-step process. First, all parts are visually inspected before being sandblasted. Afterwards, the parts are washed in our 5-stage phosphate tanks that can accommodate parts up to 25' long. Once cleaned, they're immediately dried to avoid rust production, and then outgassed. Outgassing pre-bakes the parts in a curing oven, reducing the possibility of blemishes that may be hiding in the pores of the metal. If not properly outgassed, imperfections in the metal may bubble during the curing process and most likely will cause chips in the powder. After the parts are washed and outgassed, any surfaces and / or threaded holes that need to be masked or plugged, are done so with high-temperature masking tape and silicone plugs. Next, the parts are given a quick thinner wipe to remove any light debris or fingerprints, before being hung on an electrostatically grounded conveyor line. The powder is finally applied using an electrostatic spray gun. The powder "sticks" to the surface in a fashion similar to how dust sticks to a television screen. Once the parts are powder coated, the carts are rolled into our curing oven and baked at 400° F for 45 minutes. These approach ramps were designed a little longer to help when loading low ground clearance vehicles. It's the little bit that makes a big difference. Multi-caster slip plates in the back and turn plates in the front allow for extremely precise, free-floating alignment. Multiple turn plate pockets let you position the turn plates in the location best suited to individual vehicle positioning. Provides for more clearances related to allowable equipment installations. Perfect your alignment setup. Each column has these adjustable safety ladders for multi-position leveling. 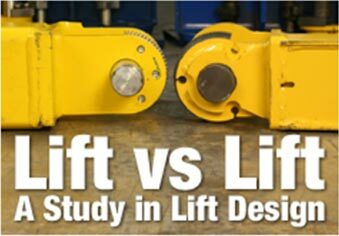 *Not all BendPak lift models meet the standards as prescribed by ANSI/ALI ALCTV-2006 or ANSI/UL 201. 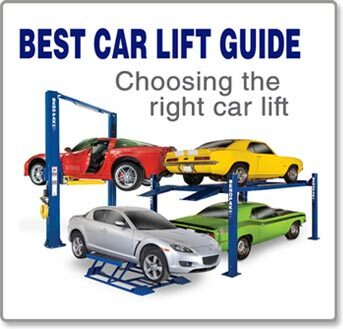 Consult www.autolift.org for complete listings or contact BendPak via contact@bendpak.com.